We've heard promises of universal app development before, of course, with frameworks like Cordova or Titanium. What's it like to actually use React Native? In this article, we'll explore what React Native is and how it works. 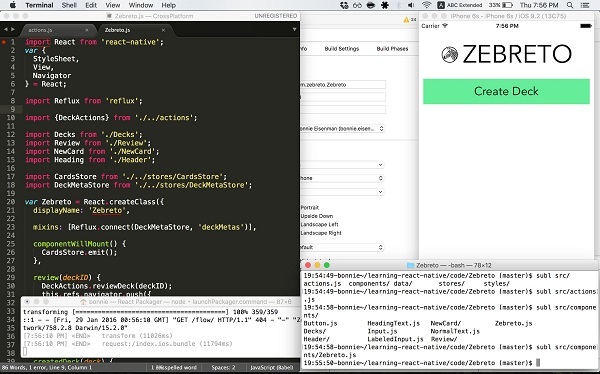 Then, we'll cover what it's like to actually use React Native to write iOS and Android applications. By the end, hopefully you'll see why React Native is a strong choice for your next mobile project! Before we dig into the developer experience, let's talk about what React Native actually is, and a bit about how it works. Developers have flocked to React for a number of reasons. It's lightweight, and offers impressive performance, especially for quickly-changing data. Because of its component structure, it also encourages you to naturally write more modular, reusable code. React Native is just React, but for mobile. There are some differences: you'll use a <View> component rather than a <div>, and an <Image> instead of an <img> tag. The developer experience remains much the same. Having some Objective-C or Java knowledge can be useful, and mobile development does come with its own tricky considerations (have I tested this on multiple physical devices? Are my touch targets large enough?). However, React Native will feel almost entirely familiar, and comfortable, to developers who already know how to work with React in the browser. In React, a component describes its own appearance; React then handles the rendering for you. A clean abstraction layer separates these two functions. In order to render components for the web, React uses standard HTML tags. 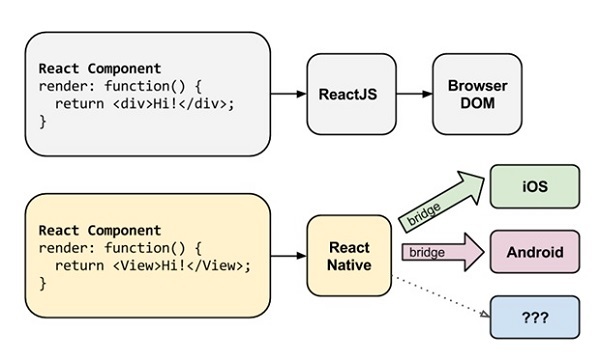 This same abstraction layer, known as the "bridge," enables React Native to invoke the actual rendering APIs on iOS and Android. On iOS, that means that your React Native components render to real UI Views, while on Android, they'll render to native Views. To start developing React Native applications, you'll need to install the ordinary dependencies for iOS and Android development, as well as React Native. There's a good guide to this on the React Native website. Setting up React Native is simple. If you already have an updated version of Node installed, then you can install React Native with npm install -g react-native-cli. Once your dependencies are installed, running react-native init ProjectName will auto-generate all the boilerplate you need to start a new project. 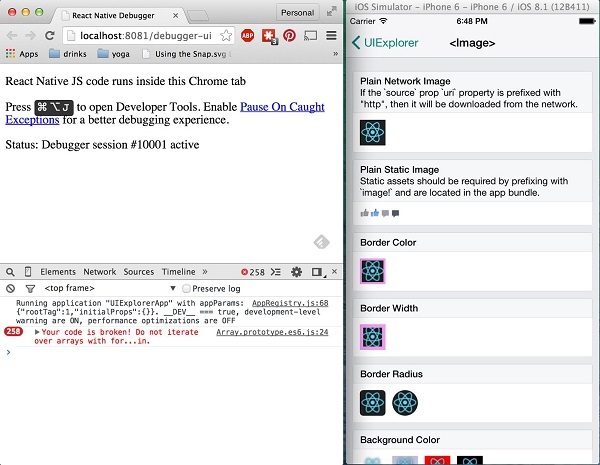 There is one catch: you'll need to use OS X in order to develop with React Native. Apple requires you to have a Mac in order to develop iOS applications, so for most developers this restriction was already unavoidable. If you want to focus on writing Android applications instead, React Native has experimental support for developing on Windows and Linux. Once you have your developer environment ready to go, it's time to start writing some actual applications. Because React Native components are so similar to normal React component, making the transition to React Native is quite easy. In order to make rendering simpler and more effective, as well as to encourage maintainable styling code, React Native implements a strict subset of CSS. This means that you don't need to learn a platform-specific way of designing your views, but it'll take you some time to learn how to use React Native's styles. The biggest difference is that you don't have to worry about specificity rules, since style inheritance is severely curtailed and React Native uses inline style syntax. The syntax is easy to read, but if you're coming from a web background you might find it a bit alarming. (There's a good reason for it, I promise!) For further reading about CSS, its problems, and React's approach to solving them, I highly recommend Christopher Chedeau's slide deck: CSS in JS. The net result of this is that you have lots of tools at your disposal. Sometimes it feels like too many tools, and the desktop clutter of having so many windows open can be annoying. On the flip side, at least React Native isn't hiding any of the standard mobile development process from you. You might do this if an API you need is not yet supported, if you want to integrate your React Native components with existing Objective-C or Java code, or if you need to write some high-performance function to handle some intensive graphics processing. Happily, React Native gives you the flexibility to write and use these so-called "native modules" when you need to, and the process is straightforward. Even if you've never worked with Objective-C or Java before, writing the "bridge" code is a great exercise in getting comfortable with native mobile development. Deploying React Native applications is very similar to working with ordinary mobile applications. That doesn't mean it's easy, as the mobile release process is known for its headaches. 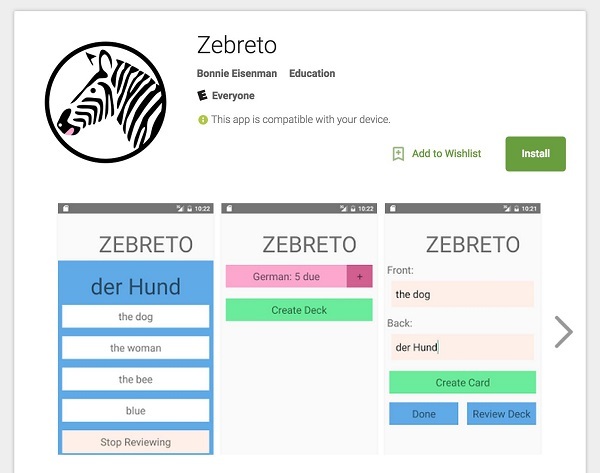 The iOS App Store took two weeks to approve my flashcard application, while the Google Play Store took less than a day. In other words, approval times were exactly in line with what I would expect for a "traditional" mobile application, with no penalty applied for it being built with React Native. React Native isn't without its drawbacks. It's still a new project, and comes with the headaches of any immature library: some features are missing, and best practices are still being discovered. Breaking changes between releases, though few and limited in scope, do still occur. If you want to read further, my book, Learning React Native, is available in both print and eBook editions from O'Reilly and Amazon. You can also find me on Twitter as @brindelle. I'd love to hear about your experiences and questions regarding React Native! Interesting read - Just sharing my use case! any thoughts on embedding tags (id, class, name, text) in the html for use with mobile automation testing (such as appium, etc) using appium? Hey thanks for your idea its good. But personally I prefer open source tools which involve no cost. I am Mohsin Khan An Sr.Android Developer from India. But now I found its pretty I will change will learn this very soon. Please help me with Learning materials.